I forgot to bring my laptop power chord home tonight, so I'm going to be lazy and skip the travelogue entry. Let's start with Bond. Moti pointed me to Film Hulk critics four part analysis of the entire franchise (you can click to all four parts from the fourth). It's made me feel a bit time for the time I compliment Yaphet Kotto on his performance in Live and Let Die. I still liked that he had a character willing to take out Bond and shoot him, but really I need to familirize myself with more of the man's work beyond Homicide and Live and Let Die. I still quite loved Casino Royale, but was left with the feel that I'd really drifted away from that sort of thing. After reading through Hulk's discussion of all the films and his argument that the best Bonds are romances, I'm instead left feeling that I might want to watch From Russia with Love and On His Majesty's Secret Service again, though those two will likely suffice. That's a nice place to be. It's not that we can't have adult conversations about our childlike impulses, it's that we can go so far as to dress up our stuffed animals and bring them to a fancy dinner. We can't just want to make our childish things seem adult. As I mentioned in the last post on the series, I enjoyed both seasons 1 and 2 of Legend of Korra but felt let down by the respective endings. Some of that might just have been expecting too much on my part; it's a kid series and ultimately more nuanced bad guys can get away from problems that a super-powered character like the Avatar can solve. That said, I do think some of the graphic novels have gotten to this a better, although I've disagreed with a friend on that matter. Anyhow, based on episodes four and five of the present season, Legend of Korra is doing a great job of focusing on the sort of stories it can tell well and that are still ones I'm very interested in. The issues of Mako and Bolin's class background, a critique of the conscription power of the state, and a family dispute between two sympathetic characters all have a lot of potential. Also Varrick, our favorite sketchy magnate is back. I have high hopes for him! The most direct villains are a group of superpowered criminals that appear to be enemies of the whole one powerful spiritual person will be charged with keeping power system. There's a whole lot of potential there without needing a great shades of gray main conflict. Finally, one bit of possibly spoilery speculation on episode 5. I believe a quote from Honoré de Balzac will prove appropriate: "The secret of great fortunes without apparent cause is a crime forgotten, for it was properly done." In any event, if you aren't watching, you can wait to see if Nickelodeon posts full episodes, but I continue to feel well rewarded for buying it on Amazon after missing that first air date. That said, if you wish to be patient, it will probably eventually be on the Nickelodeon site and it's probably still safer to buy the physical form of series as digital distribution doesn't seem any cheaper. We came into the show late, despite having good things about it from various blogs and friends for ages. Happily, we're now remedying that oversight and had a marathon of episodes 1-5 tonight. The pilot weirdness of the show was fairly subdued; the characters aren't quite the same ones we've been seeing in the most recent episodes, but the changes are of a sort that can be attributed to character development (not all of it positive) and not just the aging of the show. It also joins Venture Brothers in the list of shows with a degree of failure as a major theme. I wonder to what extent that's a new thing. Any number of sitcoms in the past had a notable degree of stagnation, but I think in both cases these shows actually grapple with these issues rather than just use it as an excuse to keep tired tropes going in perpetuity. So, any of my television history-aware friends have any insight? While focused almost exclusively on the man's virtues, the museum deserves a bit more description in its own right than it got in my thematic analysis piece. The museum starts with artifacts from Walt's life, including a childhood desk that he'd carved his initials into, a range of early drawings, a work bench, video of his ride able backyard model train, and the like. At the end of the exhibit, a film covered this territory in greater detail with pictures from his life and narrated by the man himself. Walt Disney had encountered a fair amount of failure in his day, including losing rights to Oswald, his first brand-worthy creation and forerunner to Mickey. Based on the film, it sounded as if his brother Roy had gotten Walt out of jams a fair number of times. Ultimately Walt had passed on before Walt Disney World was completed; Roy had seen the project through but died three months after. The exhibit spoke some about Disney's inspiration for Disney Land, apparently Walt was waiting while his daughters played at a traditional amusement park and started doodling ideas for attractions that would hold the interest of adults. At first this seems surprising: obviously the Disney parks have a definite orientation towards children; it may be more accurate to say he was trying to expand the appeal of such parks beyond thrill-seeking adolescents. Disney rides tend not to place less emphasis on excitement and more on story and spectacle. I think Disney was the first to really introduce theme parks with their lands inspired by genres, regions, or periods of history. Thus, it isn't surprising that the museum featured models that covered not just rides but also static attractions like the Tree of Life on the left. That's from Animal Kingdom, which I still haven't been to, but now I rather want to go if only to recapture fond memories of Quest for Glory 3. Taken to their logical extreme, these lands actually constitute a mix between a playground and a garden. See for example the Honey I Shrunk the Kids attraction, which I think gets to why they are popular settings for games and films in settings where park rules don't apply. I doubt it will ever happen, but the models even made me want to see Tokyo Disney. The Age of Discovery land seemed like it would be delightful to wander around even if there weren't any rides of note. This was often the case in the World Showcase at Epcot where the rides and films were of secondary interest to the evocative architecture and streetscapes. While the constraints are different, I suspect level design for video games have a lot in common with designing theme parks. The Square-Enix/Disney Kingdom Hearts games may be the embodiment of this idea; in the best levels fighting enemies was often secondary to jumping, swimming, and flying around to explore the worlds. Photographs by Greg Sanders and family; available under a creative commons license. The Walt Disney museum in Hollywood Studios definitely engaged in heliography but it also provided an interesting look at the man and the parks. Notably Disney was a big fan of world's fairs, trains, and Lincoln, all of which endears him to my dad who would have likely spent less time around the parks otherwise. Before Disney had gotten into the theme park business he'd had one of the little trains that kids could ride on top of running through his backyard. Similarly, the Hall of Presidents was proceeded by an animatronic Lincoln at a world's fair. The design for Epcot is perhaps most interesting; it had originally been intended to be a model community of the future. The monorail would be supplemented by the people mover, featured in Tomorrowland, and would take people to workplaces that weren't centered around entertainment. Presently, there's only one exhibition, "The Land," that really seems to fit with Disney's original vision. So, based on what I saw in the exhibit and know about Disney productions in general, I would say that there does seem to be a somewhat unique core philosophy: namely, providing high production value entertainment experiences to inspire and temporarily sate the dreams of a middle class audience. Generally speaking Disney doesn't traffic in irony or winks and nods, although that has changed some with self-aware Pixar products. As the Peter Pan ride to the left may remind you, Disney can provide the fairy dust but you have to think the happy thoughts. Rather than help you structural impediments to your dreams Disney tries to provide a walled garden where they can come through that in the real world you can recall through your imagination and the merchandise they'll gladly sell you. Walt Disney World attractions regularly refer to magic when describing their automatic doors and the like. The school of magic in question is illusion, long favored by entertainers and apparent even in the architecture. Higher levels of buildings like Cinderella's castle are built on a compounding 5/8s scale which makes them seem much bigger than they actually are. I'd add that this illusion is quite necessary; by definition not every little girl can be a princess, but skilled trickery allow peddling an upper class experience to a middle class audience. The Disney Corporation sometimes falls short of this goal; I don't doubt that they did even in Walt Disney's day, among other failings. However, I don't think it's surprising at all that this vision can be enticing to the global aspiring middle class, as shown by the innumerable Brazilian tour groups we saw during our trip. Photographs taken by my family and available under a creative commons license, not withstanding any copyrights on the original material being pictured. Walt Disney World had loomed large in Kate's mind as a kid, not an uncommon desire for American children, but she'd never made it down to Orlando. This trip we were remedying that, but since we were arriving midday we decided to hit one of the secondary parks for the first of our three days of visits. Hollywood Studios, an unfortunately generic name, is Disney's answer to Universal Studios and is an amalgamation of some Disney and Pixar-themed rides and shows with a range of other licensed properties like Star Wars, Muppets, Indiana Jones, and Aerosmith. While it is a comparatively smaller park, there was still too much to do in the time we had, so we relied heavily on a Frommer's travel guide given to us by my mother who was also along for the trip. We started out with the Great Movie Ride in a replica of Grauman's Chinese Theater. The range of sets shown, sometimes for specific films, sometimes for whole genres, was neat but the audio system could have used some work as one of the guides proved rather difficult to hear. The sets were neat and there was a cool moment with the guides, although I think they might do better if their scripts had interesting content about films rather than focusing on expressing enthusiasm for them. After hitting the Walt Disney museum, which merits its own post, we went on to the Magic of Disney Animation exhibit. That was a fun show about Mushu, Mulan's dragon sidekick, with a human 'cast member' interacting with screens showing the character and some of his original animators. Fun facts: Mushu went through a lot of iterations such as a two-headed dragon form, and the classical Chinese dragon animators were using as a reference model was said to have the nose of a camel. The show let out into a kid-friendly area where you could meet the characters, including to my amusement Mr. Incredible and Frozone, get drawing lessons, see a gallery of Snow White art, and the like. The exit was through an Art of Disney store which was my favorite type of store in the parks as they include Disney works in a range of styles, character sketches, and the like. Leaving that exhibit we wandered through Pixar Place which was very kid and Toy Story-oriented. This seems like a bit of a missed opportunity, while there were several opportunities to meet Pixar characters there weren't any behind the scenes bits like we'd seen earlier in the day for Disney proper. I suspect that may be a result of the sometime indeterminate nature of the Disney-Pixar alliance. Leaving the Pixar zone took us by the Honey I Shrunk the Kids which was tragically closed ahead of schedule! This is a shame, as in my memory that playground was awesome; there were ant hill caves to crawl through, giant spider web meshes to climb up, and the like. Lesson learned: check the closing times and give yourself some time to spare. This is probably particularly true in the off season where a fair number of rides, like in this case the back lots tour, were just closed. Shortly thereafter, Kate also experienced great disappointment that in the Pizza Planet arcade there wasn't a claw machine dedicated to grabbing the little aliens from Toy Story, the closest available was a generic alien bin. Photographs taken by the family and available under a creative commons license. I’ve finally gotten a bit of free time and so have been playing more Persona 4. I still really love that game, despite, or perhaps because, it manages to psych me out with some of the social choices and various quizzes. Most of the answers could be easily googled, but I’m going with just the knowledge I have on hand and I’ve had an embarrassing wrong streak. All the more so since I’m normally good at tests. In some ways it gets the high school vibe down cold, it’s a lot more fun, but it still feels easy to screw up and embarrass yourself. I hope I didn’t deny myself a social connection by being a jerk to someone because I was confused about whose younger brother he was. If I did, such is life, but it’s still embarrassing. I’m actually a bit reminded of the first No One Lives Forever which rewarded you for taking the professional dialogue choice and not the one that just made you sound cool. I’ve been playing in combination with Wii Fit Plus. While the free step mode doesn’t net that many calories, free running actually seems to have a similar burn rate as does EA Active Life. We just picked up the add-on for Active Life, the creatively named More Exercises. I’m not going to make the transition just yet, because the 30 day challenge isn’t offered in the sequel, instead it’s got a six week thing. That’s fine, but after running into some initial trouble, my pride is on the line on getting through the challenge this time. That said, I’m not that proud, I’m entirely willing to change the clock so that I don’t get burned get bumped to the next day for finishing at 12:05 AM. Anyways, good weekend on the whole. We’ve been working our way through Avatar Season 2 and have loved it. The story gets steadily more into mini-arcs as time goes by while still retaining an episodic charm. The only downside is that there’s only three seasons so we’re now more than half way through. I thought there were some strong points, but ultimately some parts might have been better with no wrap up than a less satisfying wrap up. Missed the last few minutes, but I caught the synopsis and will watch it in a bit and probably do some more in depth posting then. I do feel I correctly called the divine aspects, and I’m willing to bet more elaboration there wouldn’t have helped as I suspect there’s not more to elaborate on.. The anti-technology bit was dumb and wasn’t really sold by the series itself. Instead the series mostly avoided the science-side of science fiction, so I wasn’t surprised by that twist but I don’t see why anyone but crazy hippy Apollo would buy that idea. On the whole, it made me want to get to reading World War Z which I’m told does a better job of handling rebuilding from the apocalypse. Also, man did the chief go down hill post-final five knowledge. With the exception of his repairs to the ship pretty much every decision he’s made has been dumb and not even dumb with a consistent pattern. A better, harder, ending would have been to take the deal. If it were Helo, he’d have waited to finish the transmission first and then requested permission to take the shot. As another lawful good but not lawful stupid character as said, personal isn’t the same as important. The finace also pointed out that Tigh’s comment is really disingenuous considering that he killed Ellen. All and all, I’m putting labeling this one as an average ending. Some good stuff in the finale, on the character by character level I think it pulled it off well, and it did actually wrap the major threads, so points there. Finally, I am also wanting to read WWZ because we’re going to need some zombie bank slayers. Ross Douthat notices the similarities but it takes a correction from a reader to get it right. Jonathan Last comes through with the perfect pop-culture analogy. Update: Except, as a reader notes, that Tigh-Roslin is even more perfect - though rather less reassuring. I went Googling for a relevant picture and found that there's already articles and a campaign site. I'm really amazed how well this fits. Roslin was near the bottom of the line of succession as Secretary of Education which seems roughly on par, experience wise, with being Governor of Alaska. She also is a favorite of the religious and has banned abortion, although I think her personal attitudes are far more feminist than Palin's. Tigh is a navy man, a great guy to have at your back in a fight, has a bit of a temper, and was an abused P.O.W. although his experience is more recent. Also their administration shows no understanding of economics. Obvious lessons: The lesson for anyone who has noticed the McCain parallel is that he'd make a poor President. The Roslin examples suggests that we shouldn't underestimate Palin just yet. I don't think we'll have that much trouble beating her, but lets not get cocky. Kennedy is the most effective, dogged, determined, and skilled liberal legislator in the Senate. He’s one of the few Senators who is genuinely irreplaceable, whose absence would degrade the nation’s social policy, and thus the life chances and economic security of millions of its disadvantaged residents. Without Kennedy, we wouldn’t have the Americans with Disabilities Act, S-CHIP, the Family and Medical Leave Act, or any of a hundred other crucial pieces of legislation. I concur, Kennedy really is one of our toughest fighters in the Senate, an unabashed liberal but also a deal maker who could get things passed even under the current President. He’s already secured his legacy, but I’m hoping he can stick around for some time to come. Finally caught up on BSG! Non-spoilery bits first. High point of the show for me was probably the stories leading up to the start of season three. Since then I’ve still quite enjoyed it and I think at least one of the best episodes has come after that point. I don’t think that’s particularly surprising, my favorite Buffy arc was probably evil Angel and that came pretty dang early (after discussing it, I think there’s fair arguments to be made for later ones though). Four seasons is probably about right for the show, season four has been steadily revealing secrets while giving us enough time to process them rather than saving everything to the end. **SPOILERS** I’m also counting the comments as a spoiler zone. I’m rather a fan of Battlestar Galatica and happily I’m finally catching up to the series itself. We’ve got three episodes of season three left and about four episodes of the new season. Then I’ll finally be able to do some concurrent show blogging. Anyways, here I’m going to discuss the premise of two episodes, I don’t think this will entail any spoilers, but fair warning anyhow. The characters in Battlestar seem quite familiar with many military, political, and even some sociological issues. What they seem to lack is even a basic conception of capitalist economics. The fleet seems to be a command economy, supply chains controlled by the authority, currency of minimal value, and a military that doesn’t pay civilians for anything. I base that analysis off a lot of things, but first and foremost episode 214, Blackmarket. That was a fairly weak episode, as Ron Moore admits in the podcast. Aside from being far too episodic one big weakness was that the writers weren’t quite able to work out why the black market where people barter was a problem and had to throw in some standard evil criminal signifiers to make it work at all. In essence a black market is going to happen when you’re 1) trading in illegal goods or 2) trading in rationed or price controlled goods. If they’d simply shown the legal distribution venues at some point, which would be suffering from long lines and shortages (in part because of theft by blackmarketeers), then the episode premise would make sense. Episode 315 Dirty Hands, looks at labor disputes and economic classes. It’s a substantially better episode than 214 and a strong one in the series overall. I think that’s because the writers do understand how labor disputes work and can do some Marxist class analysis as well. But bizarrely, paying people more when they have terrible jobs never comes up. I’d actually be willing to accept some argument like "we don’t even have a hundred thousand people, we don’t have a mint, setting up even a rudimentary economy is too hard" but they never even mentioned the idea. Haven’t played the podcast for that episode yet, so we’ll see if any insight comes from that. So in character we can probably assume the BSG world wasn’t that capitalistic to begin with and that all the economists died in the initial onslaught. Also, probably the colonies didn’t have an Adam Smith. Out of character I hope the show either hires someone who knows economics or sticks with episodes like 315 that deal with economic issues that are politically rich enough or allow for Marxist class analysis. But no more episode 214s. Please. So last week I gave a fairly positive review of the first half of R.O.D. the TV. And I’m happy to say, the second half holds up to the degree that I have bought my own copy. The more domestic character establishing parts of the first half are largely gone, the second half is payoff as all the plot threads are brought together. I’ll save spoilers for another post, but suffice to say that I love the main villain in this series. Said villain is an excellent mastermind that has several sympathetic traits. The character tends to use words rather than violence and the evil plot avoids mass-destruction and nihilism. The baddy also represents a critique of Western civilization and a more sophisticated critique than I normally see. The whole finale is excellent. Not surprisingly it is pretty twisted and fantastical but it is bizarre in a way that has specific rules; rules the characters can use to their advantage. The way the final confrontation plays out is lovely. Although once th confrontation play out the epilogue works, but is nothing special. Also, we finally establish that the Paper can speed read. Good. I don’t get why she didn’t use that ability in the miniseries. Anyways, weak points (including minor spoilers): International relations still do not work that way, although there is one beautiful back stab. That said, look, I’m not a crazy nationalist or anything, but even I get a little tired of seeing a clear President Bush stand-in urinate on himself out of fear. Try harder people, we’re not particularly difficult to effectively insult. Similarly, Read or Die is great with small teams of commandos but terrible with major military equipment. Any attempt to send in the real power of a country will fail so badly it just isn’t interesting. Finally, there’s a sudden yet inevitable betrayal that seems mostly just to be an instrument for the plot. The character involved has some sensible anger at other good guys, but mostly just acts as a cipher. A subsequent betrayal is much better handled and actually makes sense to everyone involved. This series is recommended for: people who don’t mind some anime weirdness, fans of clever use of superpowers, fans of mastermind super villains. Bibliophiles will probably also like it, although while the series does throw references, it’s no League of Extraordinary Gentlemen or the like. So I’ve just watched through the first major exposition episode (it’s sorta flashbacky but not to the degree you want to skip it). I think that’s number 14 or so, so I’m a bit more than half way through the series. (Thanks to the friend that’s loaning it to me). The original Read or Die was a crazy three part miniseries starring "The Paper" a female bibliophile with telekinetic powers of all things paper, or to you this series parlance a papermaster. The miniseries was full of fun superpowers creatively used, oddball characters, and terrific set pieces. It was also fairly nonsensical. The T.V. series focuses on three new papermaster sisters and an author. While the whole series has a strong male fan-service vibe it passes the simple feminist test about having female characters that talk to each other about topics other than men. Book lovers should enjoy this series, although as with mini series it’s more one for historical references than League of Extraordinary Gentleman style literary refs. My favorite characters were two of the sisters, Anita and Maggie. Anita is the kid, a brat that doesn’t really like reading, but one that typically is a pretty likable kid. I normally prefer series to be fairly adult focused, but this one handled the use of a kid character and school plot lines fairly well. They make a nice change of pace. My favorite is Maggie, the who is the strong, shy, silent, and perhaps a bit dim type. I do tend to like the female version of this type. I was also fond of Milly Thompson in Trigun, although happily Maggie rather different from her as well. As to the larger plot. The episodic stories tend to vary between more domestic adventures and infiltrations/robberies. These all tend to make a fair amount of sense. The larger plot is still fairly silly but hangs together much better than the miniseries while also providing an explanation for what the heck was going on. Their take on international relations isn’t plausible, even accepting the existence of magic. Well, aside from the fact that all the major players tend to be bastards. However, the battling forces in the TV show have more interesting agendas than just being crazy and threatening the world (a real problem in the miniseries). I will note some annoyance that the extremely high body count at one key moment is seeming to be a bit under played. 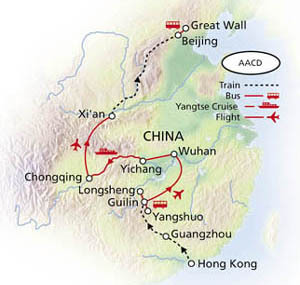 In addition do dealing with my job and this blog, I’ve spent the past month working out logistics for a trip to China. I’ll be leaving this Saturday and aside from getting to Hong Kong a day early I’ll be sticking to a China Discovery tour . I’ve just got my new laptop and will be writing up blog entries and posting photos while in China. I’ll be able to post at internet cafes and such, although there will probably be some stretches of days when I’ll have no access. Not sure if I’ll run into any censorship problems while posting there, but if I do I’ll just make the posts in question when I get home. To keep a steady stream of content, I’ll try to queue up some posts before hand including updates on where I am if the trip goes as planned. Do zoning laws give too much power to the people? Interesting bloggingheads between Matthew Yglesias and Megan McArdle covering a range of topics, notably including zoning. That’s at the start. They both agreed that most city-dwellers seem to like the benefits of high-density developments: more stores, low-income housing, transit, etc. However, they don’t want it right near them. Classical Not In My Backyard (Nimby) behavior. This kind of thing shows up even in liberal neighborhoods. Yglesias proposes that part of the problem is the level of government, specifically zoning is far too atomized. It’s far too easy to make separate rules for your block than the rest of the area. Thus hypocrisy is really easy. So moving it to a slightly higher level of government will make it harder for each block/area to come up with rationalizations why they need special rules. I think a lot of the problem here might also be that its easy to make rules that affect current and future residents differently. For example, you can say ’no more houses’ right after your house gets built. So it’s easy to be harsh because you’re making rules for other people. That said whole neighborhoods do make stupid decisions, College Park fought getting the Green Line for a while and Georgetown notoriously opposed getting a Metro stop (and has paid for it other since, ha ha). Also, bizarrely, Gossip Girls, about a high class Manhattan school, apparently doesn’t have any Jews or even Catholics. (Despite the fact that apparently the Producer is Jewish). That just seems odd. The Seoul Administrative Court ordered the Defence Ministry to reinstate retired Colonel Pi Woo-jin. She had been told she could no longer serve because army regulations require soldiers who are missing body parts to be discharged. "Her attending physician at Asan Medical Centre says she is fit to serve normal army life," the court said. "Therefore it seems there is no reason to believe the plaintiff has any disabilities that would prevent serving in the army." I’ve really got to chalk this one up to anime or manga. I can’t see why else anyone would think that breasts have something to do with piloting ability. That said good to see the court back common sense and let the Colonel get back to flying. Alexey Tolstokozhev (btw, in Russian his name means ’Thick Skin’), a Russian spammer, found murdered in his luxury house near Moscow. He has been shot several times with one bullet stuck in his head. According to authorities, this last head shot is a clear mark of russian hit men (known as "killers" in Russia). This is a second murder of a spammer in Russia. Another russian spammer, Vardan Kushnir, was assassinated in 2005. I've been watching the Ah! My Goddess TV series with my girlfriend who is a fairly big fan and collects the manga. She sent me the first volume of the manga while I was away at Denver and that's the only one I've read. I've also caught the some of the miniseries and some of mini-Goddesses so I'm not exactly new to the material. For those of you who are new to the material here's the quick synopsis. If you don't want to be spoiled about the first episode or anything, uh, just ignore this post. Keiichi, a rather innocent college student majoring in mechanical engineering, makes a phoen call one night for pizza. However, his call is rerouted to the Goddess Helpline and, sensibly enough, the Goddess Belldandy shows up to grant his wish. He wishes that she stays with him. The television series is sweet, sentimental, and doesn't take itself too seriously. It also has a terrific budget and is quite beautiful and is typically illustrated in great detail. That said, if you highly object to sentimentalism, this isn't your series. For me the main appeal is neither Belldandy nor Keiichi, although I like both of them well enough. Instead it's the supporting characters: primarily Belldandy's sisters Urd and Skuld, but other supports like Keiichi's sister Megumi and the mechanics club members are also quite fun. Urd, the older sister, is scheming and far more worldly than Belldandy. Skuld, the younger sister, is a mechanical genius but still quite young and her attachment to Belldandy can lead to her being a bit of a brat. In many ways, Keiichi and Belldandy play straight-men to these two. The series knows how to handle supporting characters well and manages to juggle a lot of them while at the same time rationing them so as to avoid bloat. Manga readers may be surprised how early many characters show up in the television version. Villainous characters are fairly secondary in this series, at least during the first season. As for the romance? Well, it's sweet but neither Keiichi or Belldandy tend to behave in recognizably human ways. They're consistent, but they're consistently lacking in desires other than to make one another happy. Instead of "idiot plots" that would be instantly resolved if no-one was dumb, our main concern may be "lack of hormones" plots in which Keiichi encounters relationship trouble because he's basically asexual. That said, all the interactions are fun and its great to watch with someone who enjoys snarking about the characters foibles. Urd also gladly provides some snark of her own. So that's it for now. In the morning I'll throw in my analysis of whether the series is problematic from a feminist point of view.